This CD+DVD contains the opening song to the TV anime Denpa Kyoushi (電波教師). The CD tracks are as follow. 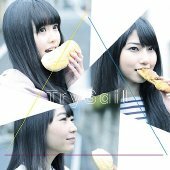 Songs by the seiyuu group Try Sail, made up of Asakura Momo (麻倉もも), Amamiya Sora (雨宮天), Natsukawa Shiina (夏川椎菜). This is Try Sail's debut single. The DVD contains a promo video of "Youthful Dreamer". There were store front advertisements for this CD in Akihabara at Gamers and Toranoana.